How Germany's renewable energy revolution took off. An unexpected birthplace for a revolution in renewable energy, Germany remains a leader in efforts to combat climate change. WYHL, GERMANY – By many measures, Germany is an unlikely birthplace for a renewable-energy revolution. Its reputation for being a generally gloomy country, with few sunny days, is well established. Its onshore wind potential is merely middling. And with the world’s fourth-largest GDP, it requires steady electricity to keep its factories humming – a challenge for intermittent power sources like the Sun and wind. But on a recent bus tour of villages of southwestern Germany, evidence of the revolution was everywhere. “At left, you see all roofs are full of solar modules,” said Erhard Schulz, pointing toward rooftops blooming with shiny blue and silver panels. Moments later, he pointed to the right, where more panels adorned a factory. Then, the bus rolled into sight of five wind turbines atop a nearby hill. The tallest of the five, Schulz explained, is capable of generating enough electricity to power 55,000 typical German homes. Turbines and solar panels like these have enabled Germany to far outshine the United States and other countries in producing electricity from renewable sources, despite its inauspicious wind and solar resources. In 2014, 30 percent of all German electricity generation came from renewables, including solar, wind, biogas and hydropower. The comparable for the U.S. – just 13 percent. And it’s ordinary Germans like Schulz who helped make it happen. The gray-haired, jolly-laughing Schulz wore a windmill-themed tie on the day of the bus tour. He is a resident of Emmendingen, a town of 26,000 that lies between the Rhine River and the foothills of the Black Forest. It was during the early 1970s, when Schulz was studying chemistry at the nearby University of Freiburg, that he joined the movement that would ultimately make Germany a global leader in the fight against climate change. Only it didn’t start out that way. Today, the Upper Rhine region – which straddles Germany, France, and Switzerland – is a popular tourist destination known for hiking, cycling, and wine drinking. But in the early 1970s, politicians from the three neighboring countries were considering the region as the site of a new industrial zone, says Kurt Schmidt, archivist for the Baden-Alsatian Citizens’ Initiative, a grassroots organization that formed to oppose the development plans. To power new chemical factories and a lead-processing plant, the government officials planned construction of up to 17 nuclear reactors. The people’s anger came to a head in February 1975, when about 300 protesters, many of them local farmers and wine-growers, occupied a nuclear plant construction site near Wyhl, Germany, on the banks of the Rhine. Three days after police compelled them to leave the construction site, the protesters returned. But this time, there were 28,000 of them. By then, Schmidt said, the local police commissar could no longer imagine violently evicting his own people. The protesters would stay. Among the protesters occupying the construction site was Erhard Schulz. From the beginning, he said recently, he believed the anti-nuclear movement could not simply say “no” to nuclear power. 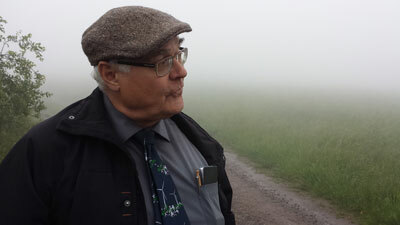 Renewable energy advocate Erhard Schulz speaks to visitors near the site in Germany of a wind turbine he co-owns with 107 others. (credit: Sara Peach). Instead, the protesters needed to talk about alternatives: something to say “yes” to. As they settled in for a months-long occupation, the protesters organized a makeshift “community college” at the construction site. There, they educated themselves about technical aspects of nuclear power. And Schulz began delivering lectures on a new, potentially limitless source of energy: solar panels. The protesters remained at the site for eight months, according to Hager’s history of the occupation. By 1977, the upwelling of opposition had made the nuclear project at Wyhl a political non-starter. These days, the protest site is a protected natural area. During a recent visit, the loudest sound in the forest was the croaking of frogs. Gentle raindrops plopped into the nearby Rhine river and fell on joggers. “It was a big struggle, and we were successful,” Schulz said, beaming. The protesters’ success inspired new anti-nuclear opposition across Germany. The growing anti-nuclear movement helped inspire the 1980 founding of the German Green Party. By 1998, after widely publicized accidents at Three Mile Island and Chernobyl, anti-nuclear sentiment was strong among the German public. That year, the Green Party won enough seats in the German parliament to form a ruling coalition with the Social Democrats, a center-left party. The new government developed a plan to shut down all of the country’s remaining nuclear plants. As had Schulz more than two decades earlier, the government looked to renewable sources as an alternative to nuclear power. In 2000, it expanded existing incentives for renewable energy when it passed the Renewable Energy Act. The law enabled anyone to receive above-market prices for producing electricity from the Sun, wind, and other renewable sources. The act is “one of the best laws ever created,” says Günter Mögele, deputy mayor of Wildpoldsried, a Bavarian village whose inhabitants earned 4.7 million Euros in 2014 by selling renewable energy to the grid (see Yale Climate Connections article on Wildpoldsried). In Emmendingen, Schulz started investing in wind turbines. With 107 of his neighbors, he is now a co-owner of the tall wind turbine on the hill that generates electricity for 55,000 homes. Such investments in renewable energy enabled Germany to generate ever more electricity even as it closed nuclear plants. One result of this shift, unforeseen by the activists of the 1970s, was this: The country’s production of greenhouse gases fell 22 percent between 1990 and 2008. In contrast, U.S. emissions rose by 14 percent in the same period. These days, the fight against climate change – in addition to anti-nuclear sentiment – is still driving the renewable revolution in Germany. The German government has vowed to reduce its greenhouse emissions by 80 to 95 percent by 2050, a task complicated by the country’s continuing dependence on coal and citizen opposition to long-distance transmission lines. But in September 2014, the New York Times reported that the German word for energy transition, “Energiewende,” is creeping into conversations worldwide. “Germany is being held up as a model, cited by environmental activists as proof that a transformation of the global energy system is possible,” wrote reporter Justin Gillis. Photo (top display): Solar panels adorn rooftops in Schönau im Schwarzwald, a southern German town where the local utility sells electricity from renewable sources (credit: Sara Peach).